Ssshhh!!! The DaVinci project has not been announced officially yet! (1): I haven't done all my homework on (learning) Scite yet - I know very little about it at this moment, and I haven't even followed the tutorials at the Lua wiki thoroughly - I had to do other things first. (3): I'm temporarily working only on IupScintilla - it needs to be finished urgently. a source code editor. This will initially be a slightly modified SciTe - SciTe is already scriptable in Lua, and can do syntax highlighting on Lua code - but in some months we also want to be able to control Scintilla directly from Lua, and to build other editors based on Scintilla, without SciTe. A debugger. 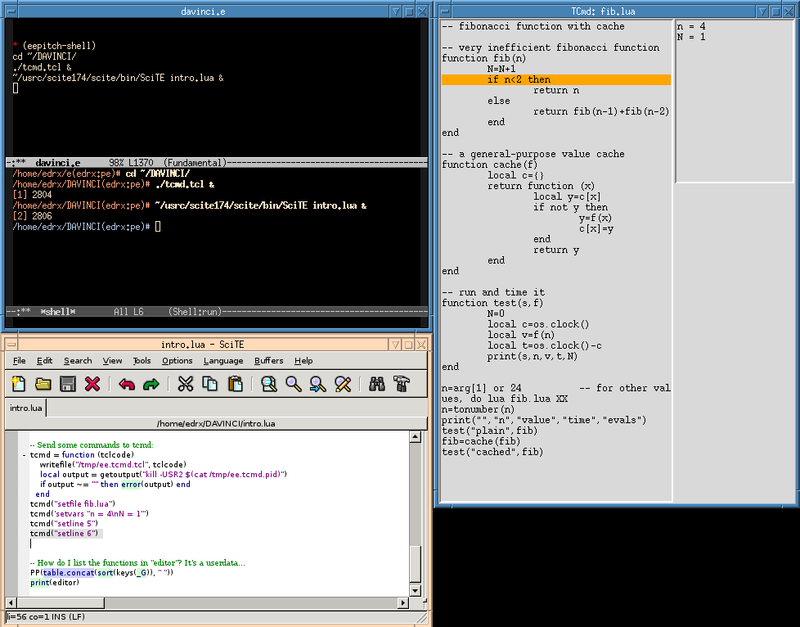 This means running a Lua debugger (either ldb or remdebug, or both) from inside the editor, and having a separate window (like this screenshot) showing the current line being executed in the source code, breakpoints, values of some variables, etc. 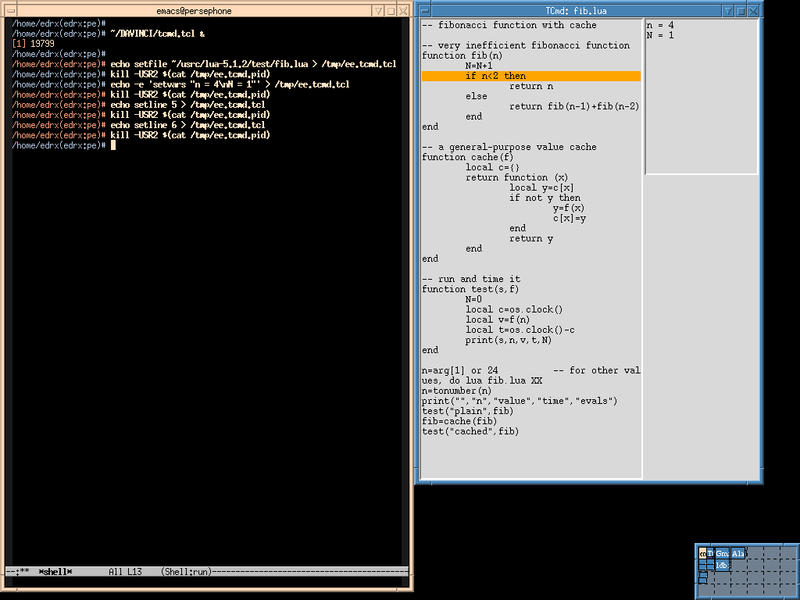 This separate window will be controlled by another graphical library - in early prototypes Tk, and later IUP. Main news (details soon): I've been hired! An official announcement is due tonight (thursday, 2007jul19). 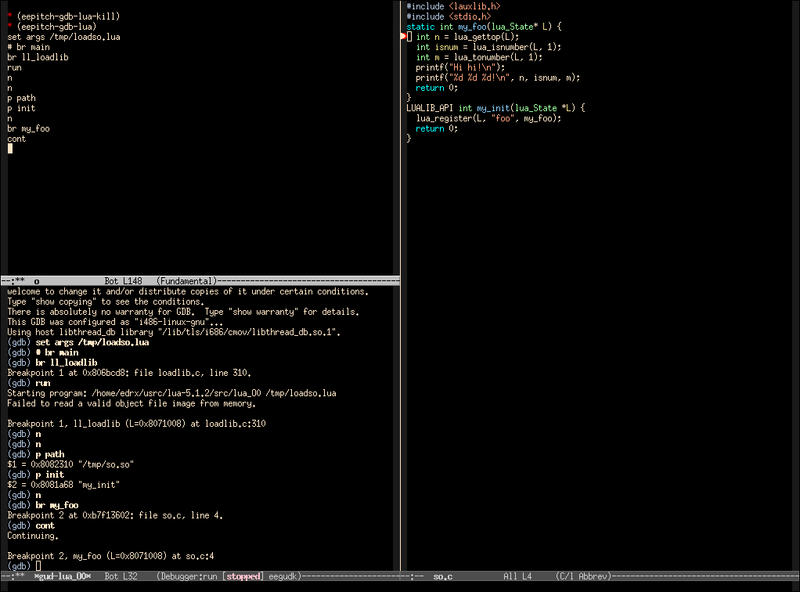 We have some trivial running code - intro.lua (incomplete) - and sketches of lots of lots of what is going to be done. Some people at TecGraf are trying to write an IDE for Lua based on IUP and Scintilla, and I'm trying to join them. My e-scripts about DaVinci are here. 2007jul04: TCmd (screenshot here). This is a prototype code for something like the debug window of LuaCmd. The source explains the rationale and inner workings. The Department where Lua was created - TecGraf - also has other groups besides the Lua group, working on projects unrelated to Lua. Several of these projects are libraries that can be used directly from C; they do have Lua bindings, but they're independent from Lua. One thing that made both TecGraf and a funding agency more interested in the DaVinci project was that it involves IUP. The department where Lua was created - TecGraf - also has other groups besides the Lua group, working on projects unrelated to Lua. Some of these projects are libraries that can be used directly from C; they do have Lua bindings, but they are independent from Lua. IUP, CD and IM are some of these libraries. I used to have the impression that only people with close ties to TecGraf used IUP and CD and IM. Some years ago when I took a look at them their source code wasn't even publically available (confirm; see this), and I've tried to compile their current source packages recently and found that very hard. But a quick look at the LuaForge pages reveals that they get lots of downloads, so they can't be as "outsider-unfriendly" as I thought they were... anyway: one of my duties in the DaVinci project, as I am an outsider who thought that IUP and CD and IM were hard to use (because they are hard to compile, etc etc), is to fix these defects and make them "outsider-friendly" for more kinds of outsiders. (To do: add links to what I already have - which is not much. This e-script and some things below it are what I use to unpack the precompiled ".so"s and load them into a running Lua interpreter; I didn't go very far in my attempts to recompile from the sources). The DaVinci project will use IUP in several ways. Some of our examples of running Lua programs from SciTe will be of programs that link with IUP and CD and IM. lcmd will use IUP for its GUI. At some point we want to be able to use Scintilla as a text widget for IUP; the versions of DaVinci that will use that will be much easier to port than the other ones. Here the event handler will have to deal with events from two kinds of windows - Tk and IUP. Also, if we start a Lua interpreter in interactive mode and then we load luatclbridge.so and libiuplua5.1.so we don't want to lose the interactive prompt; so there's stdin/readline too, and, why not, let's add on top of that a signal handler, so that this Lua interpreter will also be able to react to, say, SIGUSR2s. I expect_ed_ to have this running by August 16 - but the priorities have changed (IupScintilla has to be finished soon). here we will have a direct connection - in C, and independent from Lua, but with Lua bindings - between IUP and Scintilla; the idea is that IUP 3.0, that has not been released yet, should be able to use Scintilla as a text widget. And on top of that version of IUP we will implement a version of DaVinci that will not use SciTe. This will be more portable and easier to install than the other implementations of DaVinci, but it is much less hacker-friendly than the other ideas... I will start with the other approaches, then produce prototypes in Lua for this one, then rewrite these prototypes in C.
tcmd.tcl saves its pid to /tmp/ee.tcmd.pid, and then it waits for SIGUSR2s; to send Tcl commands to it we write these commands into /tmp/ee.tcmd.tcl, then we send a SIGUSR2 signal to tcmd.tcl; then tcmd.tcl wakes up, reads the commands in /tmp/ee.tcmd.tcl, and executes them. There are several reasons for not using communication by SIGUSR2s - it's not safe enough, that doesn't work on Windows outside of Cygwin, "why don't you use sockets? ", "why don't you use FIFOs?" - but the code to implement communication by SIGUSR2s is trivial to implement, so that's what I will use in the first prototypes. Later all the libraries that need to talk to one another will be linked into a single program, so they will call one another's functions directly. I am not exactly a C programmer, but I somehow got involved with several programs that are written in C - Emacs, Lua, Scintilla, SciTe, IUP, Tcl/Tk - and whose data structures are quite complex. (Write about the box representation of conses, how to extend it with new kinds of boxes for symbols and obarrays, and to add - and erase - addresses; discuss the Lua-ish representation; point to the two languages that can be used to access the data structures in a running program with GDB: just the commands, and commands-plus-some-gdb-output (this one would be good for e-mails); discuss the mapping between the structures in a C library and the Lua-visible structures than can be used from a Lua binding for that library). (On scripting GDB: a message to a mailing list - here and here. What really matters is the screenshot in it - and it almost speaks by itself). (Some messy notes are here, and above that block in the same page; there's a screenshot - of something trivial - here).